Sometimes the efforts taken to get yourself cook something is more than the actual cooking time. It’s exactly what happened in my case while I was thinking about this recipe. While I had so many other ideas thought for this theme, many things seem to happen at the same time that it never materialized. When I realized that I will not be able to make the other ideas that were supposed to be made, I finally thought the first day idea should be repeated with making a cup with those cookies. To motivate myself, I confessed to my group this morning that I will be baking some soon. I wanted to make these before the kids left for school, somehow I couldn’t and finally baked it after they left. I tasted the cookies, it was so good, I know the chocolate ganache in the center is going to be sinful! I took the big muffin tray and realized it will end up being very huge. Imagine the mini muffin tray yeild this size! If you plan it well and make it ahead, these will be a great party food. I can’t wait for the kids to come back in the evening to enjoy these! 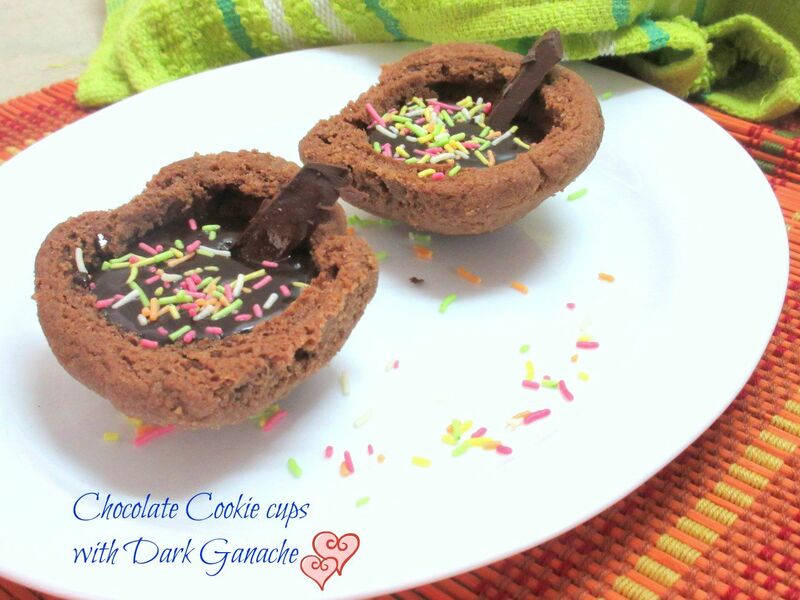 In a bowl, mix the flour along with cocoa powder, baking soda, sugar and choco chips. Then add in the butter and knead to a dough. If required add few drops of milk for binding. Grease the under sides of a mini muffin tray, divide the cookie dough into small balls and cover over the muffin moulds. Bake in preheated oven at 185 C for 5 mins, then at 170 for 15 mins. Let it rest for it to cool down. Meanwhile MW the cream at 30 secs, then add chopped chocolate and MW again for 30 secs in 2 spurts. 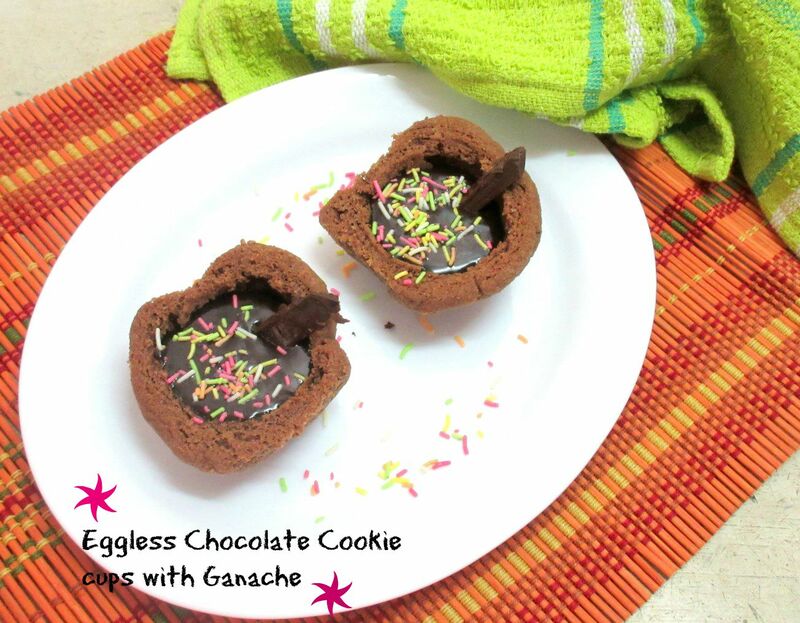 Total time taken for the ganache is 1 and 1/2 mins. Whisk well. when the cookies are set, pour the ganache into the bowls and sprinkle the sparkles along with chocolate shaving. 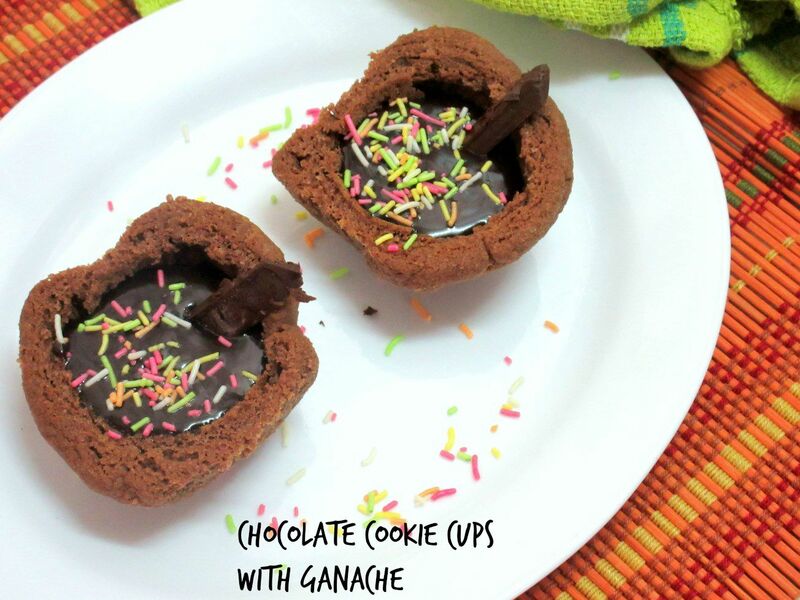 Wow, those cookie muffins with ganache looks so tempting. I wish I could grab one through the screen. Just awesome. Lovely way of serving chocolate! Wow very innovative dish.Looks so delicious. They look so cute and easy. Am sure my daughter will love this…have to try them now.